TOP: First-place winner at the 24th annual Utah Navajo Fair chili cook off is Teresa Yazzie from White Cone, Ariz.
BOTTOM: Lena Guerito, the chili cook-off coordinator during the 24th annual Utah Navajo Fair, shows the audience how to make her chili. When it comes to chili, these women knew what to do as they put their personal recipes to the ultimate test during the Utah Navajo Fair Chili Cook-off on Sept. 13. Teresa Yazzie, Shirlee Bedonie, Annie Oldman and Ophelia Holiday brought their cooking skills and ingredients to prove to the judges they have the best chili recipes around. First place went to Yazzie from White Cone, Ariz., a four-time competitor who finally took home the top prize by wowing the judge's tastes buds with her tropical salsa. "I wanted to make something different," Yazzie said. She entered two recipes and both were salsas, eggplant and tropical. Her tropical salsa was a mixture of cilantro, tomatoes, mangos, onions, avocados, and cherry peppers. Her eggplant had jalape–o peppers and yellow peppers with cherry tomatoes. Yazzie brought in a total of 423 points that earned her a cash prize of $500. "It felt really good because I've always been in second place," Yazzie said. "I enjoy what I do." "I like to challenge myself," Yazzie added. Lena Guerito, chili cook-off coordinator, said the chili cook-off is showing off the contestant's culinary skills, promoting healthy cooking, practicing sanitation and providing a variety of new healthy recipes to the public. "There are just so many things you can do with chili. We're trying to inspire using more veggies in the recipe," Guerito added. "They're very creative in their various ways of making chili," Guerito said of the contestants, and that's what makes the cook-off so good because you get to taste their recipes. "I always look for the more creative and traditional foods." Creative indeed because some of the contestants added ingredients one wouldn't normally find in chili, like peaches, watermelon and mangos. Each of the contestants was scored on a five-point system in three different categories that featured several subcategories. Judge Kimbro Talk said what he enjoyed most about this competition was when the contestants took the time to explain what they were making and the steps need to create their dishes. All the contestants were judged on personal hygiene, chili and workstation cleanup. Within the chili categories the judges were looking at the appearance, aroma, taste, originality, what they used to cook the chili and the recipes provided. Roast eggplant in a skillet and then dice onions, peppers, cilantro, tomatoes, yellow peppers and garlic, mix together. Add basil to the mixture before serving. Mix all the ingredients together before adding the chili into the mixture. Mix the blue mush and water, and then gradually add the chili powder while mixing. Mix the boiling water and ch'ilchin, stir until it's nice and creamy, then add the bananas for natural sweetening. Cook the beans for six hours and add water when needed every 30 minutes to an hour. After beans are fully cooked mix in the other ingredients. "It was interesting," said Judge Tovina Yazzie because this was her first time ever judging a contest like this and she felt she learned a lot of new things about cooking chili and what you can do with chili. Second place went to Oldman from Montezuma Creek, Utah with four recipes, two of which were her traditional chili recipes involving blue corn mush and ch'ilchin and her other two were watermelon salsa and fresh chili beans. "They're all good," Oldman said of her recipes and it was hard for her to narrow down what recipe to use for the cook-off. Oldman's recipes brought in a total of 410 points earning her $350. Her watermelon and chili beans recipe Oldman said was her top one this year. While some good cooks are secretive about their best recipes, Oldman said she enjoys sharing hers with others. "I like to cook," Oldman said, adding that she likes exploring with different ingredients - but everything is natural, giving it better flavor. 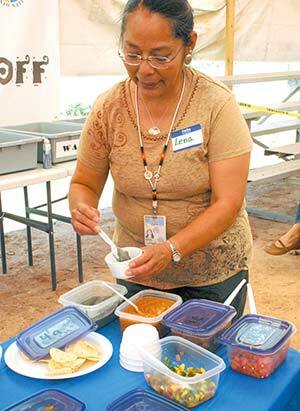 Third place went to Bedonie from Kayenta, Ariz., who entered four recipes that made peach salsa, green chili on top of tortillas, guacamole and salsa. "That's all natural, I didn't add anything to it," Bedonie said of her recipes because she wanted to bring out the flavors. Bedonie got 396 points earning $200. "I like to display what I'm doing, and I also would like people to see what I'm making," Bedonie said. She noted that to really learn a recipe, people should watch what's being prepared so they can make it at home. Holiday from Oljato, Utah, got fourth place with a total of 381 for her recipes earning $150. "I'm a chili eater, and I think I learned something new from all these people today," Talk said. He said the chili cook-off was a great display of healthy cooking because of all the natural flavors used within the recipes and he looks forward to trying to make them at home. Contact Shondiin Silversmith at ssilversmith@navajotimes.com.